Atmospheric rivers could flood California again. Storms capable of causing a $1 trillion flood in California have hit multiple times in the past, so it is only a matter of time before one occurs again. The most recent one occurred back in the winter of 1861 – 1862. A 45-day period of torrential rains from multiple storms carrying a strong “atmospheric river” (AR) of tropical moisture impacted the state, turning California’s Central Valley into a lake 300 miles long and over 20 miles wide. 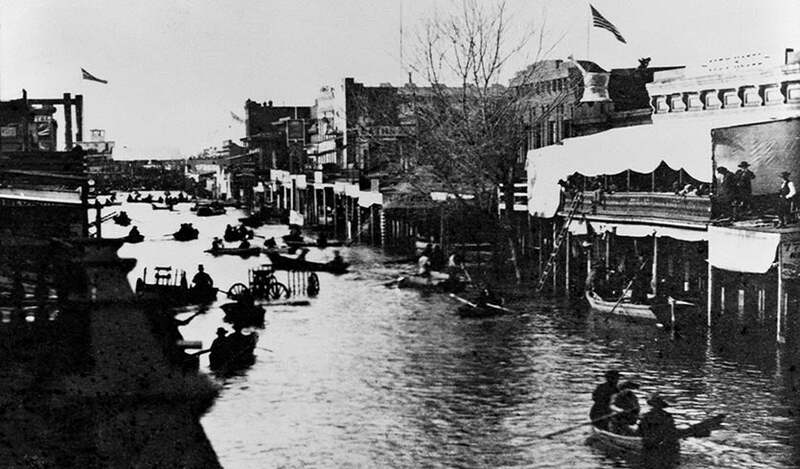 The resulting floods put downtown Sacramento under 10+ feet of water, forcing movement of the state capital to San Francisco. Sediment research has found that six storms even more severe than the 1861 – 1862 storm hit California in the years 212, 440, 603, 1029, 1418, and 1605 AD. If a storm with an equivalent amount of precipitation were to hit California now, it might do $900 billion (2019 dollars) in damage, according to a 2011 study by the USGS called the “ARkStorm Scenario” (the “AR” stands for Atmospheric River, and the “k” stands for the number one thousand, since the storm could be expected to bring 1-in-1000-year rains to some locations). The storm they modeled could flood up to 25% of all buildings in the state, breach approximately 50 levees, and force the evacuation of 1.5 million people. Yes they try and claim “Climate Change” is going to make things worse. But to anyone with a brain the historic floods make it clear these atmospheric rivers are normal and will occur again.